This tiny, unassuming eatout had recently been voted as one of the best idli - coffee joints in Bangalore which invoked our curiosity to check out the place ourselves. But as luck would have it, we would always end up here when it was closed - on Sundays and after 7pm on other days. They are also closed between 11 am to 3pm on all days. It opens at 6-30 am and by the time we reached the place, around 8 am on a Saturday morning, it was packed, with people spilling over to the road and many families even having their tiffin-giffin in the confines of their cars. 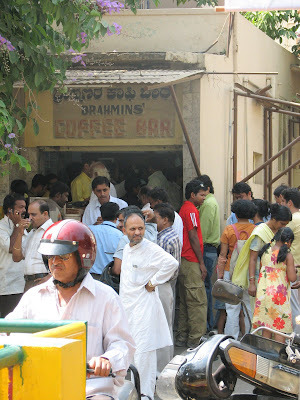 The coffee bar serves only 3 items - idli, vada and kesari baath - and of course, coffee and tea. Since this is a 'self-service only' joint, you have to first buy the tokens for your items at the counter near the entrance. Then starts the herculean task of squeezing your way through the crowd milling around. 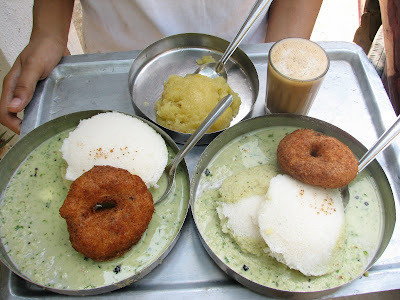 When you finally reach the serving counter, catch your breath, get your snacks on a tray and turn back, you realize that you are now faced with the near impossible task of making your way out of the place without spilling tea or dropping a steaming idli on someone around or worse, yourself! Once outside, there is an old man standing right near the entrance, pouring chutney for everyone on their plates (a prize for making it out of the place in one piece, perhaps? ;)). Now that the hardships are done with :), its time to happily gorge on the simple but superb food. The idlis are quite fluffy and soft, the vada - crisp and not over done. I'm not a huge fan of kesari bath and Balaji found it was fine but a tad too sweet - too much of pineapple, we guess. There is an unlimited supply of chutney, thanks to the thaatha who happily pours it for all who ask. Nothing better than a steaming cuppa to end an enjoyable breakfast. The coffee and tea -served in Kerala tea house kind of glasses - are quite good and upto the mark. This place is definitely worth a try for true blue fans of idli-vada-kaapi. We do not have the exact address or phone number of the place but to get there, take the Bull Temple road from the Gandhi Bazaar side. There is a HOPCOMS and then a Neeladri office on the left. Take the right turn in front of this, go a little ahead and to your right, when you see a place teeming with people, some sipping piping hot coffee and some downing steaming idlis - you'll know you are at the right place! .......................that the idli finds mention in the Kannada writings of Shivakotiacharya in 920 AD, and it seems to have started as a dish made only of fermented black lentil? One description circa 1025 A.D. says the lentils were first soaked in buttermilk, and after grinding, seasoned with black pepper, coriander, cumin and asafoetida. The Kannada king and scholar Someshwara III, reigning in the area now called Karnataka, included an idli recipe in his encyclopedia, the Manasollasa, written in Sanskrit ca. 1130 A.D. Healthy food is generally perceived as bland and boring. However, a cookery show where Sanjeev Kapoor was featuring a zero-oil recipe - roasted pepper prawns, caught our attention last week.It seemed so easy to make and looked so good that we tried it out later that week. Paired with pasta, it turned out to be a simple, healthy and fulfilling meal - one that can be cooked when you are pressed for time. Boil the broccoli florets and carrots with very little water in a pressure cooker. Five minutes is enough or else the veggies will end up overcooked and soggy. Mix the tomato ketchup, ginger garlic paste, mustard paste, cooked carrot and broccoli, prawns, salt and ground black pepper. You can add a little more tomato ketchup if the mixture seems too dry. However, go easy on the mustard paste, since it has an overpowering flavour that can mask the taste of the other ingredients. Heat a cooking pan and roast the chopped garlic- no oil, remember?- for a minute. Now add the mixture prepared earlier and cook on medium flame for around 8 minutes. Garnish with fresh, torn (this brings out the flavour) basil leaves. Dried basil available in most stores can also be used instead. Add some lemon juice if desired. Serve with pasta cooked as mentioned below. Cook the pasta as per instructions on the pack. Remember not to overcook it; it should be al dente. Make sure you add a couple of drops of olive oil to the boiling water so that the pasta does not turn out sticky. Once cooked, drain and keep aside some of the pasta starch. Heat the remaining olive oil in a pan. Add the arrabiata sauce and cook on medium heat for a minute. Add 4 tbsps of the pasta starch and cook for another minute. Now add the cooked pasta and dried basil and oregano. Toss till the sauce and pasta get mixed well. Serve hot. The whole meal took about 30 minutes to make but the end result looks like a lot of time has been spent on it - truly gourmet ;). All the items for the recipes are easily available at departmental stores. Jumbo sized or atleast medium sized prawns would be ideal for the roasted pepper prawns though we used small prawns. The recipes given above serve two. ......................that the arrabiata sauce is called the angry sauce? The word arrabiata is Italian for "in an angry mood", which describes perfectly the spicy, zingy flavor of a good arrabiata sauce. ......................that "spaghetti" is the plural form of the Italian word "spaghetto", which is a diminutive of "spago," meaning "thin string" or "twine"? The word "spaghetti" can be literally translated as "little strings." Picture this - hot, just-off-the-tawa parathas with a dollop of butter on it, steaming hot channa masala and a tall glass of creamy buttermilk to wash it all down with.....sounds tempting, doesn't it? Then we suggest you set off to Ulsoor where, right next to the Gurudwara, you will find authentic Punjabi ghar ka khana at Bobby ka dhaba. Bobby ka dhaba - blink and you'll miss it! The dhaba is easy to miss because neither does this oh-so-tiny place look like a restaurant from the outside, nor does it have a board announcing its existence. And to top it all, the neighbouring restaurants, when asked for directions, will pretend like they do not know where this dhaba is.....they probably cannot digest the competiton :) ! The first time we went here, we were alarmed by the sight of the dhaba from the inside. A tiled ceiling with quite a few broken tiles here and there, walls that badly needed a coat of paint, furniture that was nothing more than a few tables and stools and an old wheezing refrigerator in the corner. In the middle of it all was Bobby, shouting instructions and orders to his kitchen staff in Punjabi. Nothing much has changed now. Except for the ever increasing clientele and the old faithfuls who visit the dhaba for a true taste of surprisingly affordable, Punjabi food. The menu is very simple and basic at Bobby's dhaba. Five to six kinds of parathas, a few side dishes, kheer and buttermilk are on the offering. Parathas are served with butter, pickle and a plate of sliced cucumber and onion. All side dishes are served in portions just enough for two. The sight of the steaming hot parathas with the butter slowly puddling on top is enough to make you hungry even on a full stomach! The mooli and onion parathas that we tried were soft and piquantly delicious. Channa masala and aloo jeera make for good company along with the parathas. They are not overtly spiced, like you would expect from typical Punjabi cuisine, so it suits all palates. 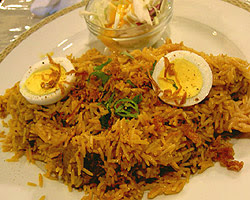 The egg bhurji, the only non-vegetarian dish available here, is also a good accompaniment to the meal. It is peppered with green chillies and a hint of garam masala which gives it the right amount of zest. And now coming to Balaji's favourite part of this meal - the buttermilk. Rich and frothy, served in a tall steel glass, it is the perfect cooler after a heavy meal like this. Our quest for the best buttermilk in town ended here! Service is quick and efficient. Inspite of the Sunday crowd, the staff made sure we didn't have to wait for too long in between orders. Bobby da Dhaba is open for lunch between 12-30pm and 3.30pm and for dinner from 7.30pm to 11.30pm. It gets a little too crowded on Sundays due to the devotees from the Gurudwara dropping by, so come prepared to wait a while to be seated. But take our word for it, the wholesome food here is worth the wait. The right place for foodies to chak de phatte!!! .......that Indian immigrants took the paratha to Malaysia and Singapore, resulting in variations such as roti canai and roti prata? In Myanmar (Burma), where it is known as palata, it is eaten with curries or cooked with either egg or mutton, or as a dessert with white sugar. 13 READERS CLICKED HERE TO COMMENT ON THIS POST. ADD YOUR COMMENT!